Today (28/05/2013), in the front page of YNET (The Israeli leading internet news site) appeared a link to a translation of the article that was published this week on the Daily-mail about EHS. The link said "Help me, I am allergic to iPhone" and in small letters "women in briten claim: we suffer pain when being around electric appliances, and WI-FI...Is this real?". The translation included small part of the testimonies of the EHS persons and few words from Dr James Rubin and about his false study. I was able to post a comment about EHS condition and about the studies of Dr. James Rubin and the mistakes he did in these studies (the biggest one was exposing all the subjects to different types of EMF/EMR also during the shame exposure as explained in my post - http://norad4u.blogspot.co.il/2013/02/why-dr-james-robin-ehs-study-is.html ) . 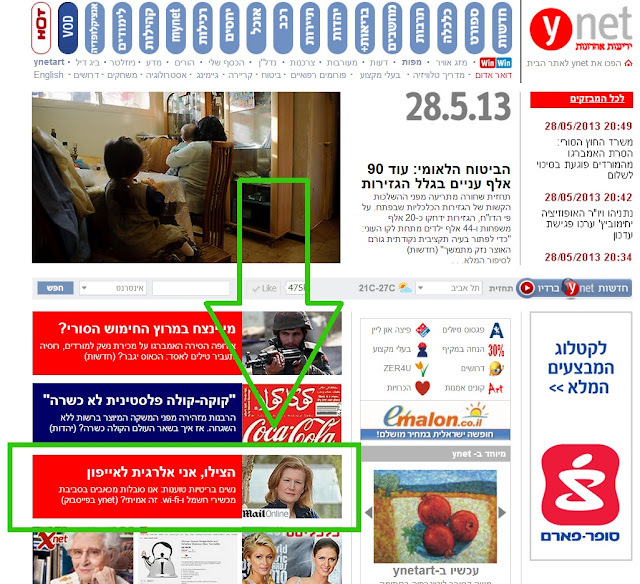 This is the first time that EHS hits the front page of YNET. I would like to thank all the people who made the original article published in the Daily-mail. Every article the is published around the world is an important step forward!